One hundred children from the Galilee town of Kfar Tabor will sing "Happy Birthday" to President Shimon Peres Tuesday night. Mazal tov. One Hundred children from the Galilee town of Kfar Tabor will sing Happy Birthday to President Shimon Peres Tuesday night, complete with a birthday cake and candles. His birthday on the English calendar was August 2. The ageing and ageless president works dawn to night on a schedule that would tire out most people half his age. Tuesday morning, he met with visiting Chinese Chief of Staff General Chen Bingde and IDF Chief of Staff Gabi Benny Gantz. The main topic of their discussion was improving relations between the two countries following several years of a diplomatic chill because of Israel’s being forced by the United States to cancel military exports that included American technology. Tuesday night’s birthday celebration, the beginning of the 17th day of Av on the Hebrew calendar, coincides with the 110th anniversary of the founding of Kfar Tabor, located between the northern Mediterranean Coast and the Jordan Valley, which is the reason the town's children were chosen for the fete. Peres is Israel’s ninth president after having served twice as Prime Minister, once with former Prime Minister Yitzchak Rabin in a rotation agreement. He has lost several other attempts to serve as Prime Minister but is respected worldwide for his statesmanship and his eternal optimism for peace, and the Peres Center for Peace in Tel Aviv which he founded is the recipient of significant funding. He is credited with creating Israel's atomic plant in Dimona. In Israel he is subject to severe criticism from the right as he was the architect of the disastrous Oslo Accords, which he hid from then-Prime MInister Yitschak Rabin until negotiations were almost completed. He is also the coiner of the now defunct phrase "A New Middle East" referring to the tranquillity that he hoped economic prosperity in Israel and the Arab states would bring. A rare public admission that his peace plans have gone awry was heard from Peres after the expulsion of Jews from Gush Katif and northern Gaza in 2005, a move that then-Prime Minister Ariel Sharon said would end rocket attacks on the rest of the country. After the Palestinian Authority escalated missile attacks, encroaching on the southern edge of metropolitan Tel Aviv, President Peres said he could not understand the aggression following Israel’s withdrawal of all civilians and soldiers from the Gaza area. 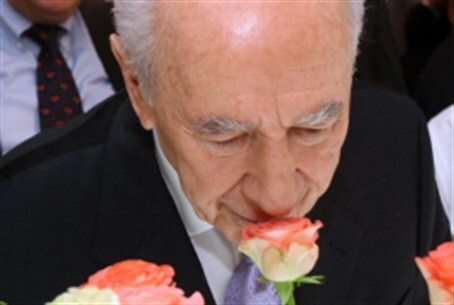 President Peres was born in Poland in 1923 and was first elected to the Knesset in 1959. His father immigrated to Israel in 1932, one year before Hitler took power n Germany, and his family followed him in 1934. However, all of Peres' relatives who remained in Poland were slaughtered in the Holocaust, and Rabbi Meltzer was burned alive in his synagogue.